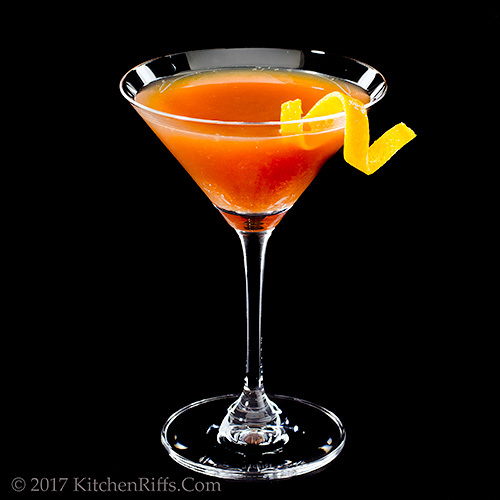 Last month, when discussing the Rob Roy Cocktail, we noted that there aren’t many scotch-based cocktails. Well, there aren’t. But the Blood and Sand is another of the few. 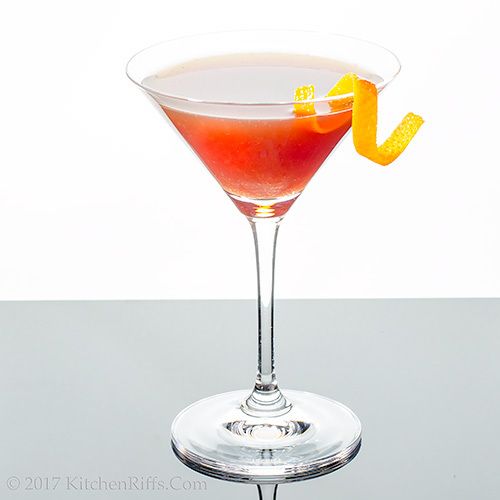 A recipe for the Blood and Sand first appeared in print in the 1930 edition of The Savoy Cocktail Book. 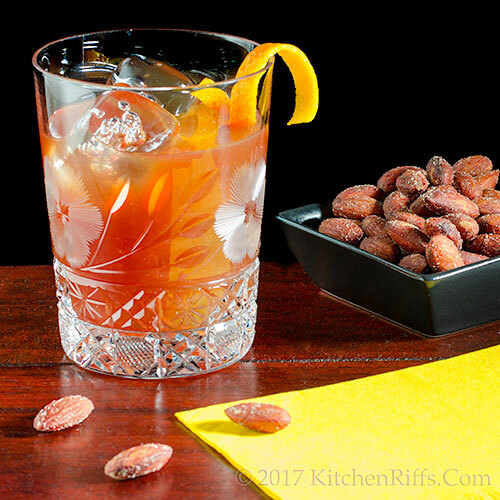 The classic recipe calls for equal parts scotch, Cherry Heering (cherry brandy), sweet vermouth, and orange juice. That makes a pretty sweet drink, though. We prefer more modern, dryer versions that use two parts scotch and one part each of the other ingredients. Fresh-squeezed orange juice works best in this drink, but you can use the bottled “fresh” stuff in a pinch. And if you have blood oranges, they’ll add extra color. Traditionally, the Blood and Sand is served straight up in a cocktail glass. But we also like it on the rocks. Combine all ingredients (except garnish) in a cocktail shaker half-filled with ice. Shake until well chilled (about 20 seconds). Strain into a cocktail glass (preferably one that’s been chilled; may also serve in an Old-Fashioned glass over ice). Add an orange twist for garnish, if you like, and serve. Scotch aficionados swoon over single-malt scotch. But for cocktails, we prefer to use blended scotch. It’s less expensive, and the flavor works better. But if you insist on using single-malt, you’ll have a wonderful drink. Any name-brand blended scotch will work well in this drink. If in doubt, ask the friendly folks at your liquor store. Cherry Heering is a sweet, ruby-hued, cherry-flavored Danish liqueur (technically, it’s cherry brandy). We use it mainly as a cocktail ingredient. But you can also enjoy it straight, either chilled in a cordial glass or on the rocks. You can substitute tequila (or bourbon) for scotch in this drink. If using tequila, we recommend a nicely aged reposado. The Blood and Sand Cocktail is a favorite at Tiki-Ti, the famous Los Angeles Tiki bar. They generally serve it on the rocks. When they pour a tequila version, the whole bar (it’s a small establishment) chants Toro, Toro, Toro! as the bartender adds tequila to the drink. Sounds like our kind of place. Valentino’s screen version of Blood and Sand was based on a 1908 novel by Vicente Blasco Ibáñez (in Spanish, the book is titled Sangre y arena). The first movie adaptation of the book was directed by Ibáñez himself in 1916. But the Valentino version of 1922 became much more famous. Another screen adaptation appeared in 1941, starring Tyrone Power, Linda Darnell and Rita Hayworth. And it was remade once again in 1989, with Chris Rydell and Sharon Stone. So what’s the plot? A poor village boy (Juan Gallardo) grows up to become one of Spain’s great matadors. (Small town boy makes good.) He marries his childhood sweetheart. But once he becomes a celebrity, he begins to lust after a rich widow. So it’s a love triangle. The usual, ahem, BS. Valentino played the part of Juan Gallardo (of course). He considered Blood and Sand his best film, and hoped to be remembered for it. But he was probably best known during his (short) lifetime for his role in The Sheik, a 1921 desert-romance potboiler. “Or death in the afternoon,” said Mrs K R.
Hi Liz, we like both the scotch and the tequila versions of this drink. You'll have to do a taste test to see which you prefer! :-) Thanks for the comment. What a beautiful drink! I really enjoy scotch but I've never tried this cocktail--it sounds delicious though! Hi Kelsie, since you like scotch, bet you'll really like this! It's a fun drink. :-) Thanks for the comment. 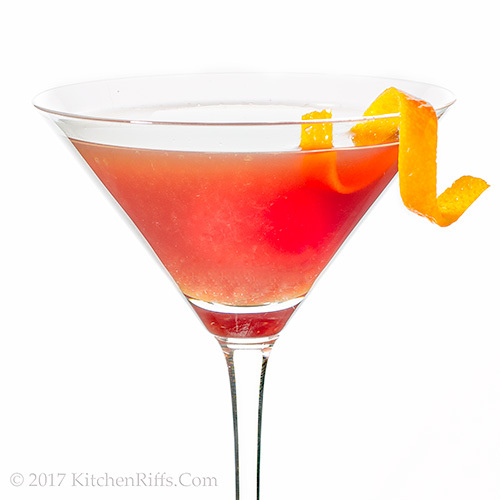 It's a beautiful cocktail, I particularly love the garnish (which, by the way, I recently perfected for a really interesting photo shoot). Hi Cheri, we do have fun with them! And they're our favorite posts to write. :-) Thanks for the comment. Hi Holly, never too beautiful to drink! You can always make another to look at. :-) Thanks for the comment. Hi Eva, cocktails are all about the colors and the shape of the glass and the garnish. It's pretty easy to do an "OK" garnish, but a really good looking one does require a bit of work (at least for me). Thanks for the comment. A little creepy name but it looks & sounds tasty. Hi Pam, the name is a bit creepy, isn't it? Good drink, though. :-) Thanks for the comment. Wow, that is just an awesome cocktail. Very tempting and nice. I'd swap out Basil Hayden's Bourbon, for the scotch, drink it straight up and watch the film while sipping away, that is--the updated version! It's a great name for a drink and seems like one should be relaxing on the beach while drinking it. Beautiful red color too. It's a must, maybe tonight! 😉 If only we could make such neat clean twists here! What's the secret? Hi Ritu, this really is tempting, isn't it? Good stuff! Thanks for the comment. Hi Pam, the secret to the twist is to roll it tightly around something round (like a chopstick or a straw) and then slightly press both ends inward to help set the curl. Then repeat about a dozen times while you're taking the pictures! :-) Thanks for the comment. I love the color of this drink - so perfect for summer! I tried scotch for the first time a couple weeks ago and really enjoyed it. Hi Laura, scotch is nice, isn't it? And works really well in this drink. But then, the tequila version is really good too! :-) Thanks for the comment. Hi Evelyne, scotch is indeed a matador or a drink! Particularly the single malts that I know you favor. :-) Thanks for the comment. Hi Shashi, no drink is too pretty to sip on! That's why we have cameras -- so we can take their portraits. :-) Thanks for the comment. Hi Deb, the first half of the 20th century was really the golden age of cocktails! So many good ones developed then. Thanks for the comment. Hi Liz, isn't it? And tasty! :-) Thanks for the comment. Toro, toro, toro! Count me in. I can still remember my dad watching bull fights on tv. This was way before cable. He used to watch those crazy wrestlers, too. I can assure you though-that he wasn't drinking this! Great, John! I'll try it! Thanks for the help! My pictures will never be as fine as yours! Hi Abbe, I've seen bull fights on TV, but that's as close as I've gotten. I guess this drink doesn't count. :-) Thanks for the comment. Hi Maureen, the name of this is definitely gritty! :-) Thanks for the comment. Oh my! Sounds like a drink that a volley player would make after a long game that he/she LOST! Hi GiGi, love the volleyball reference! :-) Thanks for the comment. ot familiar with the movie nor the cocktail Blood and Sand. Will need to check them both out. I used to be a big Scotch drinker, but it's been a while. This sounds like a nice beverage to revisit it. Thanks John! Hi MJ, this is pretty tasty. I'll bet you'll like it. :-) Thanks for the comment. Very cool drink! There are so many liqueurs that I've not heard of and this cherry one sounds interesting. Pinned. Your cocktail photos are so enticing -- and this one inspires me to go beyond my usual habit of sticking to classics. I might make this a new classic. Hi Lea Ann, Cherry Heering is fun stuff. Plus you need it to make a Singapore Sling! :-) Thanks for the comment. Hi Rosemary, this is really an interesting drink. Fun to make, more fun to drink. :-) Thanks for the comment. I am all over the tequila version. Love the name, the color and the wonderful story. Going to look up the movie - don't think I've ever seen that one! Happy Cinco de Mayo to you both! Hi Tricia, Happy Cinco de Mayo! And have one of these (tequila version) to celebrate. Or two. :-) Thanks for the comment. That's a stunning creation, John. Great shots too. This is one I've never heard of (though there are probably a great many I've never heard of! ), but it sounds good AND it's so pretty! Ix-nay on the toreador pants for me, though! Awesome cocktail John, this is perfect as I started to enjoy cocktails with whisky...thanks for the recipe! Definitely gonna pick up some fresh orange juice so I can make this! The color is so eye-catching! Hi Angie, it's a good drink! :-) Thanks for the comment. Hi Jean, there are hundreds of drinks out there. So much work ahead of us. :D Thanks for the comment. Hi Juliana, whisky cocktails are great! As are all the others. :-) Thanks for the comment. Hi Ashley, fresh OJ is good is so many different cocktails! Including this one, of course. :-) Thanks for the comment. Hi Anna, congrats on the new job! One -- or two -- of these would make a nice celebration. :-) Thanks for the comment. That title certainly caught our attention. I think on the rocks sounds really nice and love its color. Mrs. Riff and you are such a hoot! Does she help you write the commentary at the end of your posts? Hi Bobbi, Mrs KR does indeed help write those endings (she actually helps with the entire post). I do the first draft, then she edits the entire thing. We both particularly enjoy working on the endings. :-) Thanks for the comment. Hi Marta, it's an interesting one, isn't it? :-) Thanks for the comment. This is so beautiful! I love the color and I'm guessing I may see stars if I drink it. You certainly have a way with your photos. Hi Vicki, it's a good drink. Stars or not. :-) Thanks for the comment. How funny! When I saw the title of the cocktail, I immediately thought it sounded like a movie title. And it certainly looks cinematic in the glass. Hi Carolyn, tastes pretty cinematic, too. :-) Thanks for the comment. This looks refreshing and delicious. The color is so beautiful. Hi Amira, we served the tequila version of this tonight -- really a good drink! Thanks for the comment. Hi Beth, although we enjoy the few scotch cocktails we know, drinking it all by itself is our preference, too. But it's fun to experiment! :-) Thanks for the comment. Since I am not a Scotch drinker, I belong to the Vodka team, i would love to try this cocktail! Looks very tasty and refreshing! Blood and sand is a great name, this looks really tempting. Hi Raymund, Cherry Heering is interesting stuff! It's a really good cocktail ingredient (and some people like to drink it neat). :-) Thanks for the comment. Hi Katerina, try the tequila version of this since you don't like scotch -- it's really good, too. Thanks for the comment. Hi Caroline, it IS tempting! :-) Thanks for the comment. Hi Lux, good drink. :-) Thanks for the comment.